The Calgary Roughnecks are set to battle the New England Black Wolves tonight at the Mohegan Sun Arena. Game time is 12:00 p.m. MT. Calgary is coming off last Saturday’s 13-9 victory over the Vancouver Stealth, which propelled them into a playoff spot. Early on, the teams kept it close but the Roughnecks came back after the halftime break with an offensive attack netting seven goals to overcome the Stealth. 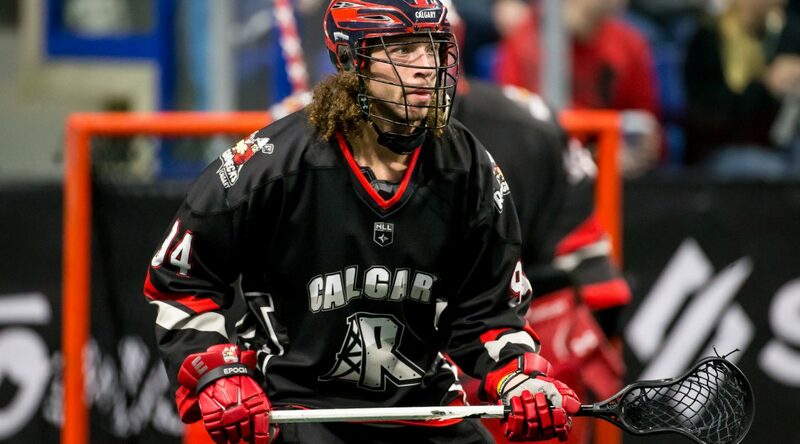 Curtis Dickson (3g, 5a) led the charge for the Roughnecks with eight points while Dane Dobbie was next with five. Wesley Berg (2g, 1a), Holden Cattoni (1g, 2a) and Tyler Digby (1g, 2a) were also key cogs in the match recording three points each. Corey Small (2g, 2a) and Pat Saunders (2g, 2a) both tallied two goals and two assists each to lead the Stealth who were outshot by the Roughnecks 69-52. The New England Black Wolves last saw action on Mar. 31 when they fell 14-11 to the Buffalo Bandits extending their losing streak to four games. NEW ENGLAND: Tonight marks the one and only regular season match-up between the Roughnecks and New England. Since 2015, when the Black Wolves played their inaugural season in New England, the Roughnecks have gone undefeated against their East Division rival outscoring them by a combined 47-30. In their last meeting the Roughnecks rallied past the Black Wolves in a 18-13 victory to snap a three-game losing streak. Mar. 25/17 at CGY: CGY 18 NE 13 … Black Wolves opened scoring just 43 seconds into the action before Calgary eventually responded. The teams alternated taking the lead until the Roughnecks solidified their advantage with an 11 goal second quarter. Wesley Berg (5g, 4a) and Curtis Dickson (3g, 6a) led the Roughnecks with nine points each while Dane Dobbie (3g, 4a) and Jeff Shattler (2g, 5a) were next with seven points apiece. Frank Scigliano stood tall between the ‘Necks pipes for the full 60 minutes of action making 42 saves to bring home the win. Kyle Buchanan (5g, 2a) and Shawn Evans (3g, 4a) both had big outings with seven points each to lead the Black Wolves but their efforts came up short. PLAYOFF BOUND: With Calgary’s 13-9 victory over the Vancouver Stealth last Saturday at the Langley Events Centre, the Roughnecks have clinched a playoff spot in the West Division. Since their establishment, the Calgary Roughnecks have advanced to the post-season 15 out of 17 seasons. ROUGHNECKS IN THE NLL TOP 10: Christian Del Bianco tops the NLL with a 10.30 goals-against-average. His .803 save percentage is also number one…Dane Dobbie is third in the NLL for penalty minutes with 38 and is tied for third with 11 power play goals…Wesley Berg is tied for eighth in the NLL with nine power play goals and is tied for tenth in power play assists with 11… Curtis Dickson is also tied for tenth in power play assists with 11, he is third in the NLL in goals scored with 36, is tied for first in shorthanded goals with three and tops the league in shots with 232 and in turnovers with 59 … Tyler Pace is sixth in rookie scoring and tied for third in defence scoring with 19… Zach Currier tops the NLL for loose balls with 148 and is tied for fourth in caused turnovers with 25. ROUGHNECKS MONTH-BY-MONTH: December (1-2), January (0-3), February (3-1), March (2-2). COACH’S CORNER: Assistant general manager and head coach Curt Malawsky is the winningest coach in franchise history with 50 victories. He passed Chris Hall’s mark of 46 in the team’s triumph over Colorado on Feb. 10. Malawsky was first-named to the job in August of 2012. SPECIAL TEAMS WATCH: Calgary’s power play is fifth in the NLL at 45.61%. The penalty kill is fourth in the league at 49.11%. ROSTER MOVES: Mar. 22 – The Roughnecks have released Steph Charbonneau from the Practice Player List. COMMUNITY SUPPORT: On Wednesday, the Calgary Roughnecks proudly announced the Star Wars-themed jersey auction, held at ElevateAuctions.com, raised $13,520.60. The auction dollars combined with a $25,000 donation from Crescent Point Energy sees a total of $38,520.60 directed to STARS Air Ambulance. The limited-edition jersey featured BB-8, a droid who serves with the Resistance. BB-8 was introduced in the 2015 release of The Force Awakens and recently appeared in The Last Jedi. This unique jersey made its one and only appearance of the 2018 NLL season on January 27 when the Roughnecks hosted the Saskatchewan Rush in the team’s third Star Wars Party presented by Cardel Homes. THE ROAD AHEAD: Following tonight’s game, the Roughnecks head back to home turf when they welcome the Buffalo Bandits to the Scotiabank Saddledome on Apr. 14 for the Fan Appreciation Night presented by Vision Travel.